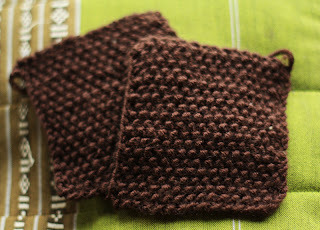 KotoLiving magazine started an interesting project: to learn new knitting patterns by knitting batches with waste yarn. Two batches with each pattern will make altogether 92 patches, and the instructions for compiling these all into a jacket will be found in the Autumn issue of kotoLiving. I'm not sure about the jacket part of this, but knitting small things and combining them into something new sounded like fun. So, here are the first two, made in moss stitch (seed stitch, helmineule).